Adolescents are particularly vulnerable to experiencing loneliness, social anxiety symptoms, and depressive symptoms. These internalizing problems often co-occur but, until now, it remains unclear how they are associated over time. Insight in these temporal sequences is important to enhance our understanding of how internalizing problems arise and may reinforce each other over time. To examine these temporal sequences, three samples of adolescents were used: Sample 1 consisted of 1,116 adolescents (48.97% girls, Mage = 13.59), Sample 2 of 1,423 adolescents (52.42% girls, Mage = 13.79), and Sample 3 of 549 adolescents (62.66% girls, Mage = 14.82). Adolescents filled out well-established self-report measures of loneliness, social anxiety symptoms, and depressive symptoms during regular school hours at three measurement occasions with a 1-year interval. Meta-analytic techniques were used to estimate the average true effects across three-variable autoregressive cross-lagged models in the three samples. In addition, indirect effects and gender differences in the temporal associations were explored in all three samples. The results suggest that social anxiety symptoms play a crucial role as potential antecedent of emerging feelings of loneliness and depression in adolescence. In addition, in line with theoretical expectations, our results suggest the presence of a vicious cycle between adolescents’ feelings of loneliness and social anxiety symptoms. The indirect effects were inconsistent across samples and no gender differences were found. These findings shed more light on the unique temporal relationships among different internalizing problems. Clinical interventions should target social anxiety symptoms to prevent feelings of loneliness and vice versa. The online version of this article ( https://doi.org/10.1007/s10802-019-00539-0) contains supplementary material, which is available to authorized users. This study was funded by Research Foundation Flanders (FWO) (Grant number: G.0565.15N). Danneel, S., Maes, M., Vanhalst, J., Bijttebier, P., & Goossens, L. (2018). Developmental change in loneliness and attitudes toward aloneness in adolescence. Journal of Youth and Adolescence. https://doi.org/10.1007/s10964-017-0685-5. Danneel, S., Bijttebier, P., Bastin, M., Colpin, H., Van den Noortgate, W., Van Leeuwen, K., … Goossens, L. (2019). Loneliness, social anxiety, and depressive symptoms in adolescence: Examining their distinctiveness through factor analysis. Journal of Child and Family Studies. https://doi.org/10.1007/s10826-019-01354-3. Epkins, C. C., & Heckler, D. R. (2011). Integrating etiological models of social anxiety and depression in youth: Evidence for a cumulative interpersonal risk model. 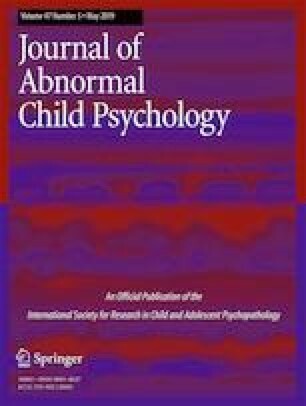 Clinical Child and Family Psychology Review, 14, 329-376. doi: https://doi.org/10.1007/s10567-011-0101-8. Wilson, D. B. (2017). Meta-analysis macros for SAS, SPSS, and Stata. Retrieved June 16, 2018, from http://mason.gmu.edu/~dwilsonb/ma.html.